James C. Justice III, left, watches his father’s inauguration as governor. He has assumed control of some Justice family companies. The Justice family companies’ difficulties paying taxes over the years are well documented. But tax collectors haven’t been the only ones trying to recover debts from companies once operated by West Virginia Gov. Jim Justice and now in control of his family. A review of court documents by the Ohio Valley ReSource found at least five cases in which judges ruled that Justice family companies failed to pay suppliers for goods or services. When compelled by courts to pay, the companies either refused or failed to meet agreed upon payments. These cases, dating back to 2013, include a failure to pay for a range of common coal industry needs, such as parts for mining equipment, coal barge services, insurance, and the royalties due to mineral property owners. The debts the Justice family companies owed in these cases ranged from just under $150,000 to a little more than $3 million. In all five cases the courts authorized U.S. Marshals to seize assets from the Justice family companies’ bank accounts in order to recover the debts. However, in some cases officials discovered the bank accounts were empty or closed. One recent case involves a contract dispute between an insurance company and Southern Coal Corp., one of the Justice family companies. Southern Coal operates 33 mines and has a coal mining capacity of 7.2 million tons, according to Bloomberg. Based in New York, National Union Fire Insurance Company provided workers compensation, general liability, and auto insurance policies for Southern Coal from 2009 to 2014. According to court documents, after coverage ended, National Union audited Southern Coal’s books and found the company owed roughly $2.7 million. In March 2014, Stephen W. Ball, vice president of operations for Southern Coal, issued a promissory note to National Union. The document spelled out how much the company would pay and set up a payment plan. The note also said if Southern Coal defaulted, the unpaid principal and interest would become due and National Union could collect attorney fees. Court records show the company made several payments, but then stopped, defaulting on almost $560,000. This July, a judge in the U.S. District Court for the Southern District of West Virginia issued a writ of execution, a legal method by which judgment may be enforced and collected. Rick Shearer is a Kansas City-based attorney who represents National Union. In an email exchange, Shearer said the U.S. Marshal’s office checked out each of the bank accounts listed. “Those entities responded that any accounts of Southern Coal were closed or now have a zero balance, or they were no longer holding any Southern Coal assets,” he said. Shearer said he has even reached out to other lawyers who have litigated similar cases against Justice family companies seeking advice on how best to recover debts. Turns out, National Union is not the first company to run into this problem. 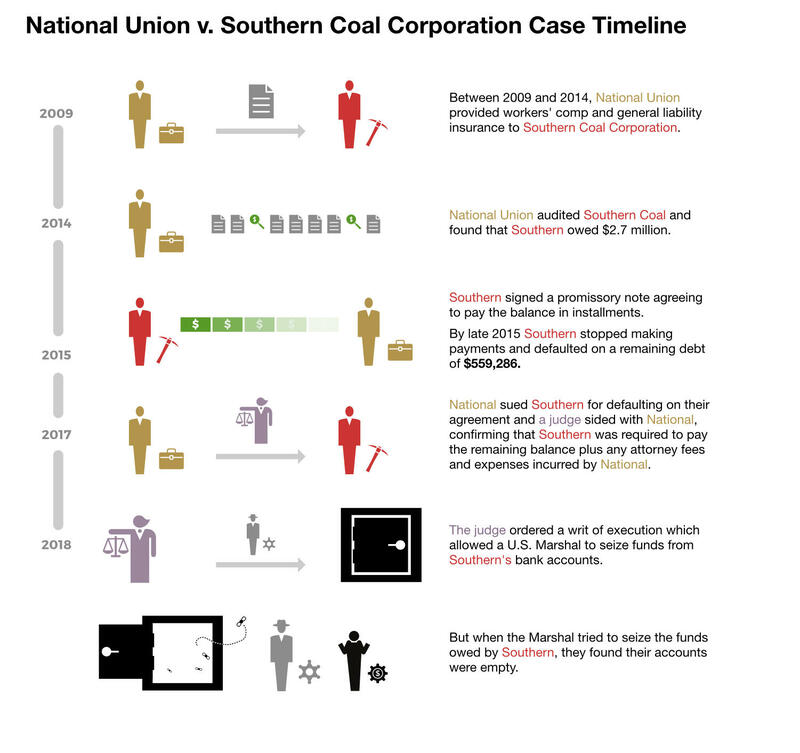 A timeline drawn from court documents shows key events in National Union’s lawsuit against Southern Coal. The Ohio Valley ReSource found five examples of ongoing or closed lawsuits where a judge issued a writ of execution to collect judgments against Justice family companies. This summer, Georgia-based paper company WestRock got a writ of execution and writ of summons to recover about $1 million owed by two Justice family companies, Southern Coal and Kentucky Fuel Corp. The companies have been battling for years over a coal contract for a paper mill in Florida. The parties settled, but after making three payments, Southern Coal defaulted. As in the National Union case, court records filed last month show the U.S. Marshal for the Southern District found nothing in the three accounts listed for the Justice family companies. Another example dates back to 2013. In March of that year Thomas Lampert agreed to sell his interest in the Three Marie Mine located in the Slab Fork District of Raleigh County, West Virginia, to Tams Management Inc., a Justice family company owned by Southern Coal. The agreement included a $2 million royalty payment, which Tams failed to pay. Lampert sued for breach of contract and a judge in the U.S. District Court for the Southern District of West Virginia sided with him. After the company refused to pay, presiding judge Irene Berger ordered Tams in July, 2016, to post an appeal bond for $2.6 million. Every day the company was late, the court ordered they pay a $1,000 fine. It took a month for the company to post the bond. After Tams and Southern Coal lost an appeal to the 4th U.S. Circuit Court, Lampert was able to collect on the bond. Other cases include disputes over coal barging services and a case involving roughly $150,000 in mining equipment, service and parts. In that 2013 case, the Virginia-based James River Equipment company sued Justice Energy Company Inc. Two years after being ordered to pay the debt, and after repeatedly failing to show up for court hearings, Judge Berger held Justice Energy in contempt of court to a tune of $30,000 per day. In that case, Justice Energy had also agreed to a payment plan, but stopped making payments after just two. In all cases, the court issued a writ of execution tapping into the bank accounts of the Justice family companies. Gov. 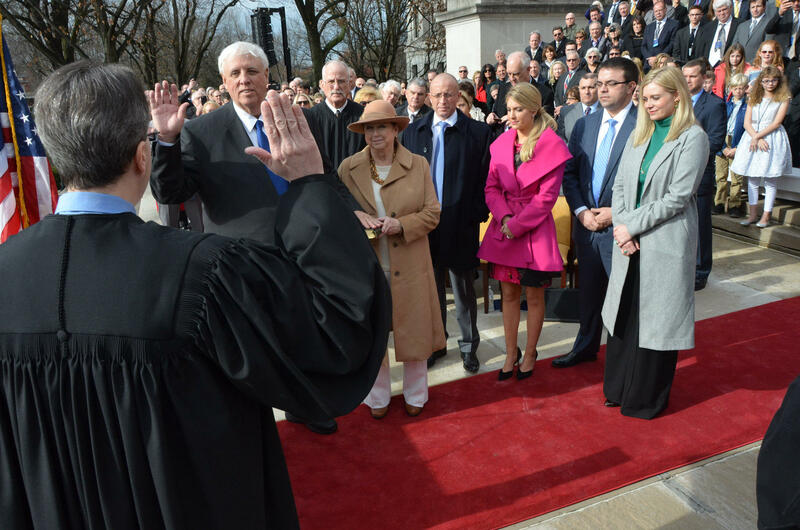 Justice takes the oath of office as his son James C. Justice III (center) looks on. John Prescott, professor of business administration and director of the Organization and Entrepreneurship Area at the University of Pittsburgh’s business school, said that it is not uncommon for companies experiencing financial difficulties, especially smaller companies, to sometimes find themselves in court over contract breaches with suppliers. He said there are many reasons this might happen, including cash flow problems or poor management. If there is no dominant supplier of a service or good, he said, the company may have many other options to consider, and it may decide that whatever hit the company reputation might take from failing to pay would be minimal. Lawyers who have represented suppliers in the lawsuits against the Justice family companies say those companies repeatedly engage in this type of behavior despite sometimes severe reprimands from the court. Over the course of the coal industry’s history, boom and bust cycles have sent many coal companies into bankruptcy and others have struggled to pay their bills. The industry’s recent downturn triggered a wave of mining company bankruptcies. In a November 2015 interview with the Charleston Gazette-Mail, Gov. Justice said he could have declared bankruptcy, but chose not to. Patrick McGinley is an environmental lawyer and faculty member at West Virginia University’s College of Law who has studied and written about the coal industry for 40 years. McGinley said the pattern of behavior laid out in these court cases may indicate the companies should be in bankruptcy. In 2016 the Ohio Valley ReSource, its partner stations, and NPR reported on millions of dollars in overdue taxes owed by the companies that Gov. Justice operated before he was elected. The Justice family companies, many now operated by the governor’s son, have since repaid some of those taxes owed in West Virginia but still owe taxes in other states, including Kentucky, Tennessee, and Virginia. 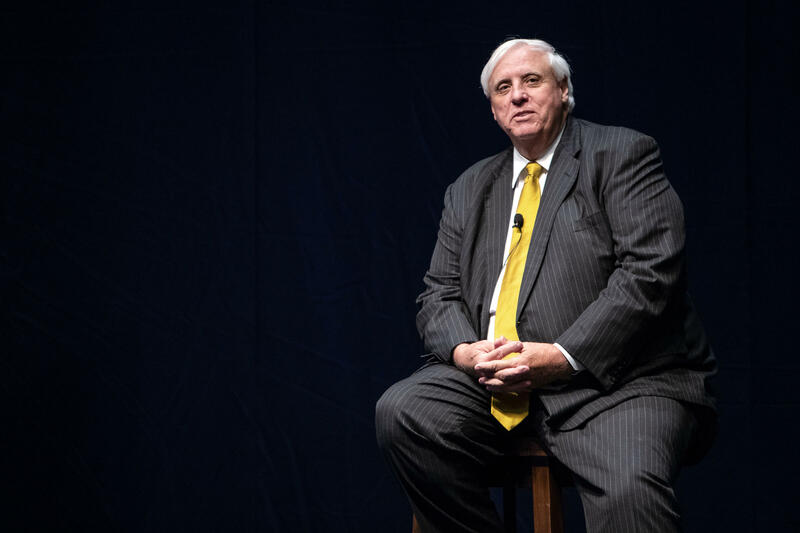 In an August news conference, Justice said back taxes owed in West Virginia by his family’s coal companies had been paid, but did not specify how much was owed or paid or if any of it had been part of a settlement. 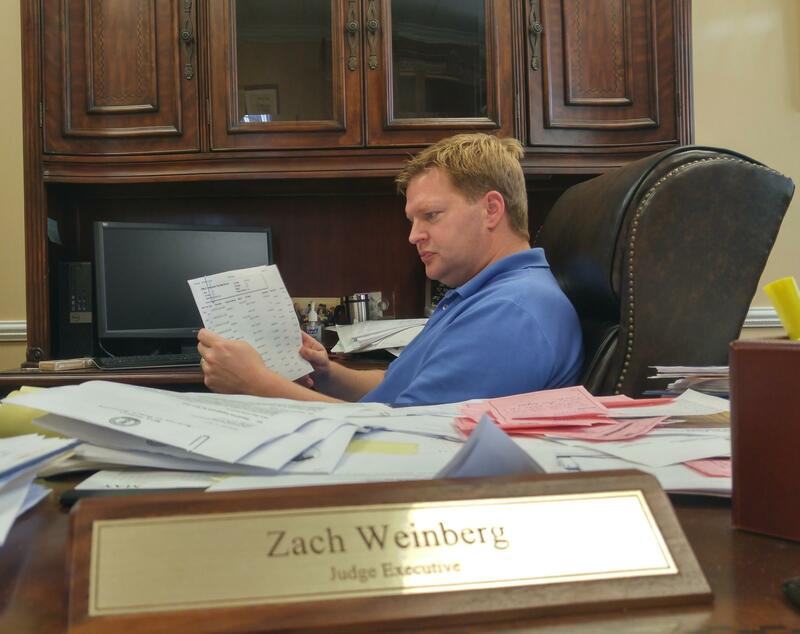 Rural counties in several other states are still owed taxes and fines that total in the millions, and county officials say they have been forced to take extraordinary measures to collect. For example, in Tazewell County, Virginia, County Treasurer David Larimer worked with the county sheriff to seize equipment at a Justice family mine this spring. The sale of two massive Caterpillar trucks raised enough money to cover all but about $150,000 of the more than $800,000 debt, he said. Justice family coal companies also have a history of mine safety violations. The October, 2016, report by NPR showed Justice companies also owed more than $2 million in overdue mine safety violation fines. McGinley added that in a contracted industry, Justice family companies are significant players, which means when they don’t pay debts the impact on other contracting companies is also significant. The Ohio Valley ReSource repeatedly reached out to the Justice Family Corporation and lawyer Billy Shelton who has represented their business interests. Shelton said he had no comment and the companies did not respond to several phone calls and emails. Before he was governor, Justice was president and CEO of more than 100 companies, according to his official state biography. Upon his election, Justice, who is a billionaire, transferred control of many of those companies to his family members, including his son and daughter. A review of business filings with the West Virginia Secretary of State’s office show, for example, his son, James C. Justice III, is listed as the director and president of Southern Coal and his daughter, Jillean Justice, is listed as an officer. When asked at an event in Parkersburg, West Virginia, shortly after the writ of execution was issued in the WestRock paper mill case Gov. Justice said he was unaware of the action. West Virginia Gov. Jim Justice gives a speech during a Department of Tourism conference Wednesday, Sept. 19, 2018, at the Morgantown Event Center. Scott Amey, general counsel for the Project on Government Oversight, a nonpartisan government watchdog, reviewed Justice’s financial disclosure form. Amey said it appears Justice has an active interest in those companies. Southern Coal, Kentucky Fuel, and Justice Energy Company are among those listed. “As of when he filed this form and signed it, he was saying that, yeah, he still had a business interest in all these companies and that that interest had a fair market value of $10,000 or more,” Amey said. But he cautioned that from the form alone it’s impossible to characterize that interest. The Ohio Valley ReSource asked Butch Antolini, the governor’s head of communications, for more information about Justice’s relationship with the businesses listed. He referred those questions to the Justice Family Corporation. Five calls to the number Antolini provided went unanswered and two email addresses that were provided bounced back. Coal miners and their families in Appalachia take great pride in their work and the fellowship that surrounds coal mining. As Jeremy Brock, one former Kentucky coal miner, put it: "It's a culture. It's a brotherhood." “Once you get used to it, I wouldn’t do nothing else," he told the documentary project, Humans of Central Appalachia, in 2016. On this West Virginia Morning, when President Trump visited West Virginia last week, he hailed his administration’s new Affordable Clean Energy Rule as something that will fuel a coal comeback. The rule replaces an Obama-era regulation intended to reduce greenhouse gas emissions from power plants. But as Brittany Patterson reports, industry experts say they don’t expect Trump’s new plan to change coal’s fortunes in the Ohio Valley -- and the administration’s own analysis agrees.